If painting a house's exterior is hard work, then removing old paint during the preparation stage is exponentially harder and less fun. Yet no prep stage project is more valuable to maintaining the long life of your paint than is paint removal. Peeling, loose, and unstable paint will never provide a solid base for your next paint layers. Can you paint without scraping paint beforehand? Yes. But while you may have an initial sense of relief at seeing peeling paint covered by new paint, it won't be long before the lower level bubbles up and compromises your entire work. No single tool currently exists that will remove house paint all by itself, in every instance and form. Rather, you need to be resourceful and have at your disposal several tools that can attack different angles of the job. If you did have to choose just one tool, though, it would be this: a manual paint scraper. The manual paint scraper is the oldest and most reliable way of removing paint. Have on hand not one but several very low-cost paint scrapers to get under those stubborn layers of old paint. 3-Inch Flat Heavy-Duty Scraper: With its handle, this scraper gives you a firm grip as you push into the paint. This tool is flat and is shaped like a large putty knife. 2 1/2-Inch Two-Edge Paint Scraper: Shaped like a larger facial razor, this tool has a thin handle and a wide head. The head sometimes has replaceable scraper blades. This tool is designed to be pulled toward you rather than pushed outward. Putty Knife: While a putty knife is designed for using wood filler or joint compound, its blunt end makes it ideal for scraping paint while reducing the chance of gouging. It takes a lot of muscle-work to scrape paint with a manual scraper but taking it slow and steady with plenty of rest breaks makes for a successful job. It helps to have on hand a sharp scraper and a blunt scraper. Run the sharp tool over a whetstone to hone it. Begin with the blunt tool. Put the scraper end under any loose paint flakes and gently push. Continue pushing until the paint no longer comes up easily. If the paint still has a raised edge, switch to the sharp tool. If not, consider moving to the wire brush to smooth out the edge. Press the scraper end under the raised edge of the paint. Gently press forward until the scraper will not easily lift the paint. An electric heat gun rated for 1,000 watts or more is a valuable tool for preparing the paint for easier scraping. While heat guns are slow, they are effective. Do not confuse a heat gun with a butane torch. A heat gun can get very hot but it does not produce a flame. A butane torch does produce a flame and should not be used as an aid for scraping paint. You can also use heat guns for other purposes, such as gently thawing frozen pipes. With the heat gun unplugged, fit one of the included scrapers onto the end of the heat gun. Many heat guns come with a variety of matching scrapers. Plug in the heat gun. Begin with the heat gun turned to low. Increase the heat as needed. Hold it close to the paint and let the paint heat up for about 20 seconds. Gently press the heat gun forward several inches to peel away the heated paint. Hold the heat gun in one hand and the blunt scraper in the other hand. Hold the heat gun, turned to low, about 6 inches away from the surface. Lightly wave the heat gun over the surface for about 20 seconds. Quickly switch to the scraper. Push under the paint, press forward, and then lift off the loosened paint. A brush with tines made of wire helps to remove raised peeling paint. A wire brush also aids in tidying up the work material after you have removed the paint. Wire brushes are inexpensive and quick to put into action, as opposed to a sander, which requires set-up time. Wire brushes are valuable for cleaning the other paint scrapers, as well as non-paint-related tools such as drywall compound knives. 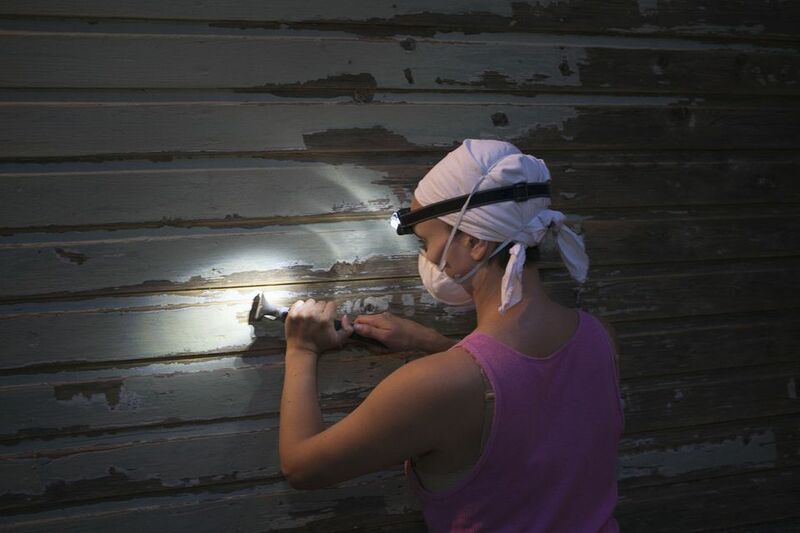 On areas of prominently peeling paint, sweep the brush lightly up and down, parallel to the edge of the peeling paint. Where the paint more closely hugs the work material, sweep in the direction of the solid paint. Clean the wire brush under running water.